The Youth Hostel and Bahrain Athletics Association’s administration building ... at Shaikh Isa Sport City. Despite the global oil slump, Bahrain’s Ministry of Works (MoW) is pressing ahead with projects in the roads infrastructure, education, healthcare and sanitation sectors. Amongst the main road network developments is the Muharraq Ring Road. The BD5.06-million ($13.42 million) Phase One of this project is being financed through the Saudi Fund for Development (SFD) and extends from the entrance to Galali and Amwaj and to the Diyar Al Muharraq entrance, passing through the entrances to Samaheej and Dair. The project, which is nearing completion, will result in a high-traffic-volume dual road on the eastern side of Muharraq island. It also includes improving the intersections at Samaheej and Dair, installing safety barriers, lighting poles and traffic signals. “This strategic project provides an alternative route for Arados Avenue (Raya Avenue) towards Galali, Samaheej and Dair villages in order to link them through the Muharraq Ring Road and provide new access points to these villages as the area is witnessing increasing construction and development activity in terms of public and private housing projects. It also provides a vital link that caters to investment projects,” says the spokesman. The Juffair Ring Road, Phase One, costing BD2.057-million ($5.45 million), is another strategic project under way. Due to be completed soon, it comprises a 4.5-km dual road with three lanes in each direction extending from the interchange of Al Fateh Highway and Sheikh Duaij Avenue in the west to Al Najma Club in the east, providing multiple entrances to the new Juffair Area and implementing lanes for emergency parking. Works also include opening an intersection on the eastern side to connect it to Juffair, constructing a concrete central reservation and brick pavements along the intersections, dredging and reclamation works, installing a stormwater drainage network and ground channels, speed humps, lighting, signage and implementing road and paving works. “All works are expected to alleviate traffic entering and exiting Juffair along Sheikh Khalifa bin Salman Causeway,” says the spokesman. Two other key road renovation projects are under way. One is a BD1.59-million ($4.2 million) upgrade of Shaikh Ahmed bin Salman Avenue in Riffa which involves reconstructing and revamping the avenue – which extends 835 m from Riffa Avenue in the north to Sheikh Isa Avenue in the south in Block 905 – with one lane in each direction. The other is the revamp of Al Muaskar Avenue (95 Avenue – Sheikh Salman Highway in the West). The BD1.12-million ($2.97 million) project comprises the revamp of the road, which extends from Sheikh Isa Highway in East Riffa to Sheikh Salman Highway near Awali in the west for a length of 2.93 km. It comprises replacing the Riffa Views roundabout with a traffic signal at the intersection with Avenue 95, constructing side pavements and central reservation, paving and asphalt works, and other related works. The MoW has also constructed a 950-slot car-parking lot at the Bahrain International Circuit. The Shura Council in Gudaibiya. Among the landmark building construction projects being developed by the MoW is the new Shura Council building that is being built on an area of 5,100 sq m. The BD2-million ($5.3 million) project comprises a three-storey building and 63 shaded parking spaces. Another institutional development nearing completion is the administrative buildings of the National Parliament in Gudaibiya. 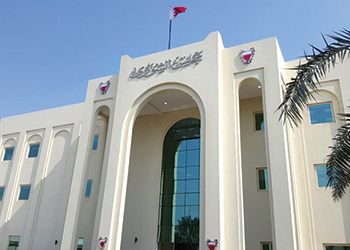 The BD1.54-million ($4.08 million) project comprises ground plus three floors covering a total area of 3,232 sq m. The third level was added upon a request from the House of Representatives. The ground floor comprises conference rooms, reception area and related facilities. The first and second floors include administrative offices and all related facilities and services. The new building has been connected to the existing Parliament building via bridges to ease movement between the two buildings and maintain a congruity in their designs. • Princess Sabeeka Social Centre, located in Hunainiya Valley close to West Riffa Club. The BD2.88-million ($7.64 million) project consists of a three-storey building that includes administrative offices, training, lectures and social halls for both genders, a 286-seat multi-purpose theatre, electricity substation, parking lot and other related services. • The Youth Hostel and Bahrain Athletics Association’s (BAA) administration building. 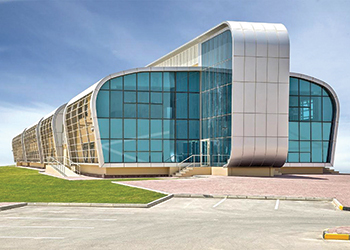 This BD2.7-million ($7.15 million) projects spans 9,700 sq m in Shaikh Isa Sport City, Isa Town. The two-storey youth hostel building, spread over 5,000 sq m, features 36 rooms with 110 beds and health facilities, in addition to two suites, a small kitchen, living room, large lobby and a spacious lounge, TV hall, games room, gym, changing rooms that include steam baths, lecture room that can accommodate up to 40 people, a prayer room and a kitchen that services the internal and external cafeterias. The BAA administrative building consists of a reception area, seven offices, two meeting rooms, a large sitting room, two supply rooms and an archives room. • The MoW has also undertaken comprehensive maintenance work for 39 public schools at a cost of BD2.56 million ($6.77 million) under its 2015-2016 programme. The Hamala sewage treatment plant. The largest projects being spearheaded by the ministry in the sanitary sector involve the construction of sewage treatment plants (STPs). The largest of these developments was the Tubli STP Upgrade, Phase Two, which has been completed by the ministry. The BD8-million ($21.2 million) project is based on the HYBrid ACtivated Sludge (Hybacs) system to improve the quality of water and to raise the plant’s capacity from 50,000 to 100,000 cu m per day. The Hybacs-based section will treat 33 per cent of the plant’s production capacity using 20 per cent of the current biologic treatment capacity. Other major STP projects include the BD1.76-million ($4.64 million) Hamala plant which involves replacing the old 250-cu-m-per day plant and with a new 1,100-cu-m-per-day unit in addition to constructing a 1.2-km-long conveyance line to transfer the treated waters to the tank located in Hamala. The project aims to provide sanitary services to residents in Hamala and to the housing projects located in Block 1010. The project will serve 644 residential units as well as providing irrigation water. Work is also under way on a network to connect the Hamala STP for Block 1010 under a contract worth BD2.12 million ($5.62 million). It involves extending 4.3 km of main sewage pipelines and 4.6 km of sub-pipelines in addition to the construction of 434 inspection rooms, and 420 connections for homes. • The BD1.49-million ($3.95 million) Quraya sewerage project in Block 551, which comprises building 4.9-km main lines and 2.7-km sub-lines, connecting 250 houses to the network and constructing two pumping stations. 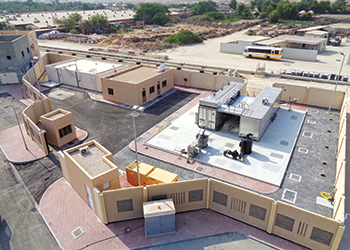 • The East Riffa E7 sewerage project, which will connect 1,127 houses to the main sewage network and extend 28 km of the main and sub-pipelines of different diameters with a pumping station that replaces three such units in the area. The project is worth BD4.2 million ($11.14 million). • The East Riffa E6 sewerage project, which is nearing completion. It comprises 38 km of sewerage extensions of main and sub-pipelines in addition to seven pump stations in East Riffa (Blocks 909, 905, 903 and 901). Costing BD8 million ($21.21 million), the project comprises Stage One (Southern part), which covers Blocks 903 and 909; and Stage Two (Northern part) that cover Blocks 901, 903 and 905, and involve the construction of a secondary sewage network, main manholes, sub-network, sub-manholes connections for homes, paving, the establishment of a pumping station and associated works. • The Seef sewerage project, Phase Two, for Block 436, comprises extending 15 km of long pipes and the construction of two lifting stations. The project serves Block 436 and is worth BD2.89 million ($7.66 million).